- Egon hoards snacks in weird places, disguised as experiments. This leads to awkward situations when someone catches him eating something out of a petri dish, but keeps it safe from Slimer. - Ray is a giant nerd and costumes at science fiction/comic book conventions. He usually collects a gaggle of fangirls for the weekend at them because he's that awesome. - Eduardo's mother died when he was a young teen and his dad worked all sorts of weird hours as a cop to keep food on the table. - Eduardo's issues with his brother stem from his falling into a bad crowd as a kid and his brother trying to bully him out of it, eventually becoming physically violent towards him. Eduardo was sent to live with an aunt afterwards. Carl loves his little brother, but is a total jerk about it anyway, being manipulative and controlling and still seeing him as a bad influence on his son even after Eduardo got his life back together years ago. The aunt he went to live with is a hippie and pretty awesome. - Eduardo works part time in the evenings at a pizza place before he gets paid to be a Ghostbuster, to help pay for utilities in his apartment. His going to school makes Carl more lenient on rent, but it hangs over his head any time his brother is angry with him (which is often). - Eduardo is smarter than he acts, but often says the wrong thing. He desperately wants Kylie to like him, but can't get over using the 'cool guy' exterior from his youth. He thinks she likes smart guys, so he bombs a lot trying to pretend he's a genius. - Kylie lost both her parents not long before Jack disappeared. After Jack's disappearance his parents never quite forgave Kylie for not remembering what the abductor looked like and insisting it was a monster. She denied her interest in the paranormal for a long time as a result, but came back to it after her great-grandmother died. She really does feel her presence sometimes, usually when she is going through a rough time. - Grandma Rose took Kylie in because for some reason her maternal and paternal sets of grandparents didn't take much interest in her. Maybe disapproved of her parents or similar. Rose was pretty much considered her only family. - Garrett comes from a loving and awesome family. He's really close to his mother, who is a soccer mom is the best ways. His mom, dad, and him all watch sports religiously; Monday night football is their version of game night in some families. He gets offended if anyone tries to help him without asking first. He genuinely wants to help people (on the old official website it says he wants to get into sports medicine or rehabilitation). - Roland is the oldest child in his family and does not flinch at the sight of dirty diapers, sick, or blood. He wants to be a mechanical engineer or go into medical technology. He's almost as altruistic as you can get; he'd give you the shirt off his back if you needed it. At the same time the concept of a truly dysfunctional or absent family is nearly foreign to him, so he does his best to help those in those situations (Big Brothers, Big Sisters is one of his favored organizations). His parents have great jobs to support all those kids. He loves board games and being around people in general. - Egon uses slime in small amount to do his hair all weird. Just because. Lol...I think most of my own weird headcanon made it out into GBOTFF fanon. I know I don't always respond in length to your threads, but they've been interesting idea factories so far. Haha, that's no problem, I post for myself anyway. I'm happy enough to have somewhere to put these where folks aren't going to a) be annoyed, or b) think I'm weird. Well, maybe the latter, but that's okay. - Egon was taught by private tutors, which resulted in skipping grades and low social interaction with kids his age. - Egon is mildly hypoglycemic, hence the thing for sweets. Gets moody when he's running low on blood sugar. - Egon suffered an injury to left left knee sometime near the second time they went out of business and it never really healed properly - not that knee injuries always do - which led to the development of arthritis in the joint. Evident by: The Sphinx, and he also leans on his right leg in the very first episode which is a weak connection but worth mention at least. - Probably the stupidest genius you will ever meet. Simple things escape his notice while he's contemplating the complicated things. Doesn't see the forest for the trees. - Not always the nicest guy. Can be cocky, arrogant, or a know-it-all without someone to act as a foil (Sphinx, there's another episode where he yells at someone but I forget which). Those traits come across more when he is trying to prove something or feels inadequate, mostly a defense reaction. - Doesn't quite think on the same level as most people would, so he often comes across as blunt or overly blase. - Loves Janine, but is conflicted about it. Feels he would just bring her more harm than good, but never really considers her feelings in the matter. Also, she downright terrifies him because he's never really felt this way about anyone, not so deeply anyway. - Experimented romantically in high school and found it boring, trivial, and unsatisfying, so never bothered to repeat the process. - Janine is not very nearsighted, just enough to be problematic without her glasses in activities like driving and reading. She could get by in a pinch without for things needing less precision. - Sometimes charges into things without really thinking about them first. - Janine's base personality is a take-charge, no-nonsense, get-er-done kind of gal. She can be a leader when she needs to be, but prefers doing the behind the scenes work because she knows she's the only one who can do it the way it should be done. - Not afraid to roll up her sleeves and get down and dirty when she needs to. - Does not cook very well, but gets by. - Knows more about plants than would be expected of her. She has a green thumb. - Knows at least some self defense. - Took quite a bit of college majoring in history and education but quit before she finished to move back home and help her family through some rough times (EGBs original pitch - so I hear - had Janine teaching a history class and the team was her idea. I imagine her and Egon would have been married in that context). Still sends letters back and forth to her college roomie, Roxanne Ritchie. - Returns to college after she is downsized to finish her degree and become a teacher. - Loves Egon, but is not afraid to call him out when she feels he is being unreasonable (Glutton for Punishment). Does not take guff from him just because of her affections, but is still more liable to have her feelings hurt by him if he is careless. - Wants to have kids, doesn't mean that's all she wants in life. - Suffers from deep rooted self esteem issues. She was teased as a kid a lot and feels very self conscious, which she expresses either by dressing outrageously to take the focus off of her and putting it on her clothes or demurely so as to blend in. Downright mousey Janine in GB1 and demure Janine in EGB. Loud Janine in GB2 and parts of RGB. Blended Janine during Makeovrus Lotsabucks phase because she was changing herself in ways she previously could not. - Had plenty of boyfriends over her life. Liked nerds because they were usually nicer and make her feel less self conscious. - Janine handles: Bills, filing, scheduling, does most of payroll until the checks need signing, purchasing (most episodes). She also keeps, checks, and writes down the PKE levels for the maintenance records on the containment unit daily and knows how to use it for basic purposes like trap flushing (Cry Uncle, episode with Watt). Doesn't want to learn how to do other maintenance because then she would be expected to do it with all her other duties, lol. Can make a guess as to what kind of ghost is bothering someone over the phone and give advice based on that. She also handles almost all customer service over the phone including complaints and issuing late notices. Sometimes does the grocery shopping more as a favor than as "other duties as assigned." And she still has time to do her nails, read a book, or do the crossword puzzle. You go girl. Venkman does later convince April to marry him, but it falls apart because he, again, can't stay faithful to her, and then she falls in love with Casey Jones. He tries to win April back one time, but stops when Casey threatens to beat the snot out of him. Deep down, he's still in love with Dana anyway--which becomes clear when an alien kidnaps him and does one of those "test him and see what his ideal life would have been" deals. Kind of like that plant Mongul zapped Superman with in an old annual. Egon Voltaire Spengler was born on October 16, 1957, the only child of Dr. Newton Spengler and his wife, the former Janice Melton. Melton came from a rich family, and Janice's father would have preferred she marry Newton's brother Cyrus. The Boogeyman haunts Egon's closet in 1965. Egon enters college in 1970, at age 12. Egon meets Peter Venkman in 1975, and the two become employees of Columbia University in 1978; that same year Newton quits NASA and enters into a partnership with an unbalaced scientist named Jurgen Frankenfurter. Newton dies under mysterious circumstances the next year. In 1982, Egon and Venkman meet Ray Stantz. The next year Egon publishes Psychokinetic Energy and the Quantum Flux, a groundbreaking paper that's derided as quackery and pseudoscience by most of the scientific community. In 1984, of course, the three friends are fired by Columbia and go into business for themselves. Janine Anne Melnitz is born on March 12, 1959, the second daughter of John and Mary Melnitz. She has an older sister, Deann, who marries Joshua Irwin and they have a son, Janine's nephew Victor. Janine also has a brother, Rick (the middle child of the Melnitz family), who sires a daughter named Bonnie (from the Slimer comics). Janine also has a cousin named Darren, who later joins GBI. Janine's bright, but can't go to college because her family is poor. So she bounces from a string of odd and temporary jobs until 1984 when some bozos called "Ghostbusters" hire her. Most of the story follows as it came out on TV. But some new twists start in 1987, when a monster called "Graar" shows up and leads the Ghostbusters into a confrontation with Dr. Frankenfurter; eventually, it's revealed that Graar is actually Newton Spengler; he's returned to normal and reunites with his son. In 1988, "Robo Buster" occurs but there's a twist at the end: Egon and Janine elope on February 17, 1988. The Ghostbusters go out of business that year, and on March 11, 1989 Albert Einstein and Marie Curie Spengler are born. (She was disheveled in "The Brookyln Triangle" because of Morning Sickness ) Later that year, a touch of postpartum depression and her own psychic sensitivities are exacerbated by the River of Slime and Janine nearly has a fling with accountant Louis Tully (it just never goes as far in our version) Janine publishes her biography, Reflections of Mrs. Ghostbuster, in 1994. The Spenglers retire from active roles with GBI in 1996. Yeah, I know. Thank goodness a lot of that crap never made it into GBOT. Winston Frederick Zeddemore was born on December 13, 1962 in New York City, the only child of construction worker Edward Zeddemore and his wife. In 1984, he's hired by Ghostbusters. He eventually meets and starts dating one of Janine's friends, Shirl Johnson; they marry on September 12, 1990. Their daughter Charlene Zeddemore is born on September 9, 1992 (which means that her GBOT birth date is actually pretty close to this). When the original Ghostbusters mostly retire in 1996, it's Winston who stays aboard to train the new team. I'm still embarrassed at how little is there compared to the others. I don't have much time to post, but I had to say this. I once proposed making his middle name "Amadeus", but nobody like that one either. Julius Raymond Stantz Jr. was born November 9, 1953 in New York City; his parents are Julius Sr. (unsurprisingly) and Margaret (ironically, the name of Venkman's mother in Paulson's fictions and GBOT); he has an older sister, Willhemena or "Billie", who is an archeologist. Ray enters college in 1971 and after graduation works for a private research firm; then he goes to work for Columbia University in 1982, and is assigned to work with Egon Spengler and Peter Venkman. In 1986, Ghostbusters hires Liz Hawthorne as a temporary secretary (when Janine goes on vacation with Egon to Mexico. Hilarity ensued in the form of a Quetzalcoatl cult). Around this same time, a female wizard known only as "the Mystic" starts helping the Ghostbusters on their cases. She's revealed as Liz during the Amot-Naphemus affair (adapted into the Ghostbusters 2021 origin story) in 1987. Ray and Liz marry on August 1, 1987. Their son Eric Stantz is born on October 1, 1988. Ray retires from full time Ghostbusting with Egon and Venkman in 1996. Ray's Ogre's favorite, so he got quite a bit of development. What? Amadeus is pretty boss if you ask me. Voltaire just made me giggle. Though Amadeus can make me grin too. Also: Frankenfurter! I hope that I am getting the reference I think I'm getting. It comes from the GBI role playing game. Jurgen Frankenfurter and Heinrich Reich III were their proposed names for potential Mad Scientist opponents. Not to say that, if I introduced the character now, he wouldn't be a sweet transvestite or anything. If so, it is a requirement he be from Transylvania. -Peter has a lot of trouble saying no to Ray if he asks for something thanks to said puppy eyes. -When Egon and Ray were introduced to each other by Peter, they didn't become what I like to call "Science Bros" straight away. Egon was his usual stoic, sorta anti social self; he met lots of smart people before and wasn't interested in making friends. Then one day Peter invited Ray to watch one of Egon's science experiments, and Ray brought a big box of sweet hostess snacks with him. Egon noticed and asked if he could have one; he and Ray split the entire box they discussed science and the paranormal over twinkies and have been friends ever since. 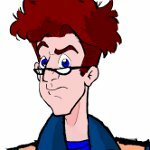 -Egon eats so much junk food that Peter and Ray have to sometimes take food off him so he doesn't get sick. He stays so thin because he says his thinking burns a lot of calories. -Ray became chubby thanks to his Aunt Lois always spoiling him with cookies and cakes and chocolate. -Ray quit smoking and drinking in order to lose weight. -Peter dislikes the idea of turning out like his father, but his father was his only male role model and he subconsciously wants to make his father proud. -With the three of the boys' families all either dead, emotionally unavailable, estranged, or scumbags, Ray, Peter and Egon see each other as their real family but it's hard for them to admit this to each other. (They see Janine and Winston family too as time goes on). -Peter is a MASSIVE closet nerd. Only Ray knows how far Peter's nerdy streak goes, because they attend conventions together and play videogames together, though Peter always tries to act as though he's only in it so Ray isn't lonely. -Aunt Lois knitted all the sweaters and sweater-vests you see Ray wearing out of uniform. She knits some for Egon, Winston and Peter too but they don't wear them often. -Peter's curly hair get's RIDICULOUSLY frizzy and messy in humid weather, to the point he'll refuse to go outside and the others have to drag him. -Romantically, Peter is actually a lot deeper than he let's on. The reason he goes through women so fast is because while he hits on anything with two legs, he can't stand them if they turn out to be dull or stupid or mean.